I was disappointed in this book. Not sure what I was expecting. The photographs are beautiful, but the designs themselves, while lovely, aren't things I can see myself making. The book is in three sections: regular embroidery, counted cross stitch, and crewel embroidery. Lovely photos and fun project ideas. I really liked this book! I enjoy Alicia's blog and her vintage inspired aesthetic- I've purchased a couple of her sampler patterns- and this book did not disappoint. I like that not all patterns are wall hangings- there's a skirt, an apron, shelf liners, curtains, a headband, etc. She lists good information about the different kinds of needlework- for example, the blackwork sampler- and the patterns are charming. The one thing I would improve is that you're supposed to copy the pattern pages and use those to transfer to your fabric. Not everyone has access to a copier, and the book isn't spiral bound to lie flat easily. It's a minor quibble for an otherwise lovely book, and I've bookmarked quite a few patterns to get started on. I've been a long time reader of Alicia Paulson's blog and I love her design aesthetic, so I wanted to love this book. However, as I am a beginner, I think the title led me astray. I would imagine an embroidery companion would focus more on basic skills before patterns. Although she does go into detail about transferring patterns to the fabric, the stitches are only listed in the appendix with a one step illustration for each. I may come back to this book after I've obtained some skills, but it's not for beginners. This book is written by one of my favorite bloggers. The picture she paints of her life on her blog is something similar to the life I see for myself, and I love her creativity. I have purchased several sampler kits from her and love every single one.The projects in this book are simple and lovely. I would like to incorporate some of this traditional style into the simple things that make a house a home.Definitely a book that I will buy a copy of. I've read Alicia's blog for a few years, and I love her aesthetic taste. I was quite excited to find this book at my library!I loved this book! At the moment I'm really not at a place where I am able to start any new projects (I've got to get this new-to-us-house organized and painted), but when the time comes, I'll be checking out this book again and embroidering some pillow cases. I perused each of the 30 projects, and I thought there'd be at least one decorative embroidery that would appeal. Nope. Too cutesy, too reminiscent of Black Forest Germany. Oh well. Onward and onward. This book has a few cute designs and lots of helpful tips. It also includes counted cross stitch and crewelwork. 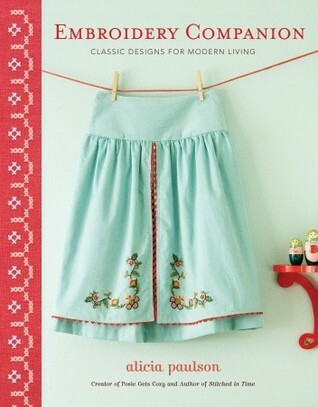 I love Alicia's blog and this was one of the first embroidery books I have bought. Loved the photographs and found it helpful. The little stories throughout were beautiful. There are some pretty motifs here amid a plethora of ugly ones, but even the nice ones look awful when executed. Plus there is little variety to the designs. Currently working my way through the projects in the wonderful, inspiring book. When the subtitle said "Classic Designs for Modern Living," I was expecting something a little more... modern. The designs are lovely but just too country-kitcheny for my tastes. Cute book... maybe a little to cute for my taste. I will probably make a few things out of this one if I have some spare time. This was lovely to look at, and though I wouldn't make all of the projects presented, it was a good resource for a beginner like me. I'll probably come back to this in the future.